Use your left over Thanksgiving turkey for this tasty Turkey Rice Porridge with Peanuts and Scallops. Makes a wonderful breakfast or brunch. Turkeys are huge birds. The ones found at the grocery stores usually weigh anything from sixteen to twenty five pounds. Smaller birds are few and far in between. Since there are only four of us eating the Thanksgiving turkey this year, I went early to the store and was fortunate enough to find a ten pound bird. Even then, there was quite a bit of left over meat. That is not necessarily a bad thing especially after I discovered turkey congee last year. In fact, I actually looked forward to a steaming bowl of congee for breakfast the next morning. I like to prepare the turkey broth immediately after the Thanksgiving feast by boiling the bones and carcass in a large stock pot. That way, it is all ready for use in the morning. Congee is comfort food for me and it is especially good in this cold weather. The version below was made with the addition of red dates and goji berries. It was really delicious! Please click on the picture to get to the post. This year, I decided to throw in some blanched peanuts and dried scallops. Both including the red dates are often used in Chinese soups. 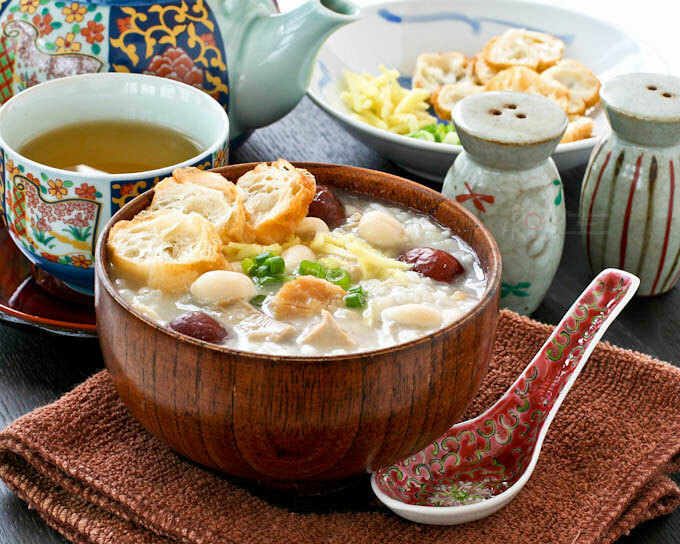 The peanuts lend a sweetness and a slight texture to the congee while the dried scallops gave it an umami flavor. 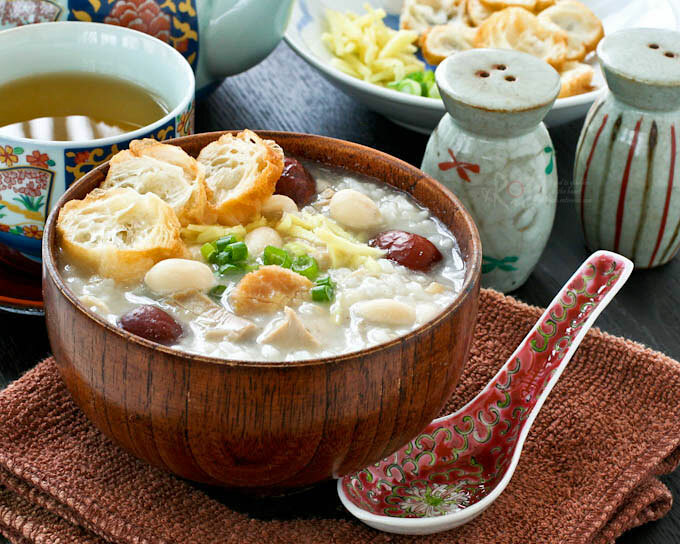 I hope you will give this very tasty Turkey Rice Porridge with Peanuts and Scallops a try. Rinse and soak peanuts in a bowl for 30 minutes. Do the same for red dates and dried scallops in separate bowls. Drain. Pour turkey broth into a large pot. Place pot on the stove and bring it to a boil. Add peanuts, red dates, and scallops. When stock comes back to a boil, reduce heat to medium low and allow it simmer for 30 minutes or until peanuts are slightly soft. Add rice and turkey meat. Continue to cook for another 30 minutes. Season with salt and pepper. If porridge gets too thick at any point, stir in ½ cup (120ml) water or broth to dilute to preferred consistency. Turn off heat and serve immediately in individual bowls. Sprinkle with green onions, ginger, and pepper. Drizzle with a few drops of sesame oil and soy sauce. 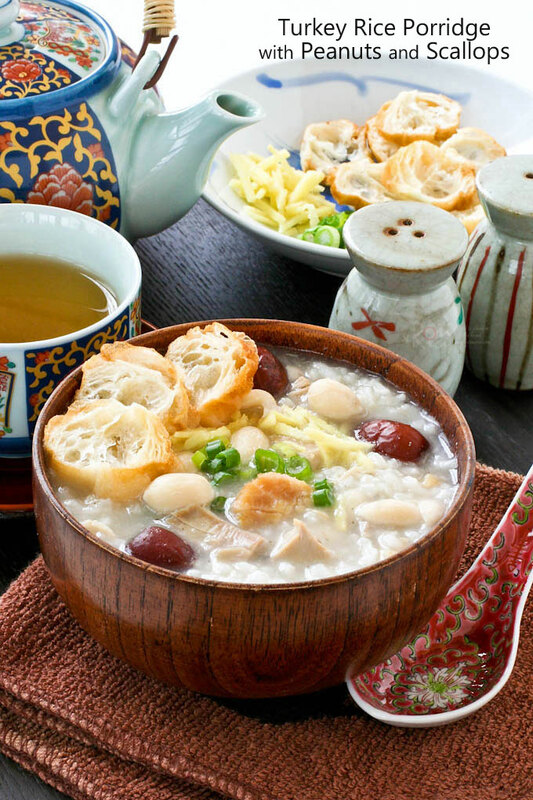 I’ve had congee, but never turkey congee – what a great way to use leftovers! I really like the addition of the peanuts – such nice flavor and crunch! Good recipe – thanks. We actually look forward to turkey congee for breakfast. It is so warm and comforting. Delicious! This is no ordinary congee, eh, Biren? With the addition of scallops and goji berries, this is what I would call a “superior” congee. I will definitely borrow this idea for the leftover turkey for Christmas this year. I love your congee bowl, so unusual! Btw, tried out the turkey satay and it was a instant hit! Thanks! I think you will enjoy the congee. It is really tasty and good way to use up all those left over turkey. That is a wooden bowl from Japan. 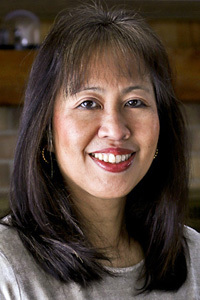 I love your version with adding dates and scallops. Looks so delicious 🙂 I made Turkey Rice Porridge many years back but only add some English celery and onion with some ginger. Wow, this porridge looks delicious! Great use for leftover turkey and I bet a bowl of this is so satisfying and warms the belly! Hope you had a great Thanksgiving! Thanks Julia and thanks for visiting. The soup sounds as good as it looks! I love the use of the red dates and peanuts and of course, the turkey stock is a definitely must. Your porridge and the congee both delicious! It’s amazing how much turkey you get off of a bird! I bought a 15 pounder, fed 6 people and had enough leftover to split between the three households. I’ll be cooking down the carcauss this weekend and sharing that as well. Gotta love the holidays! I can tell you this is almost every M’sian favourite especially the elderly. It even merrier with the additional chicken feet. Slurppp…. Hope you’re having a wonderful day, Brien. 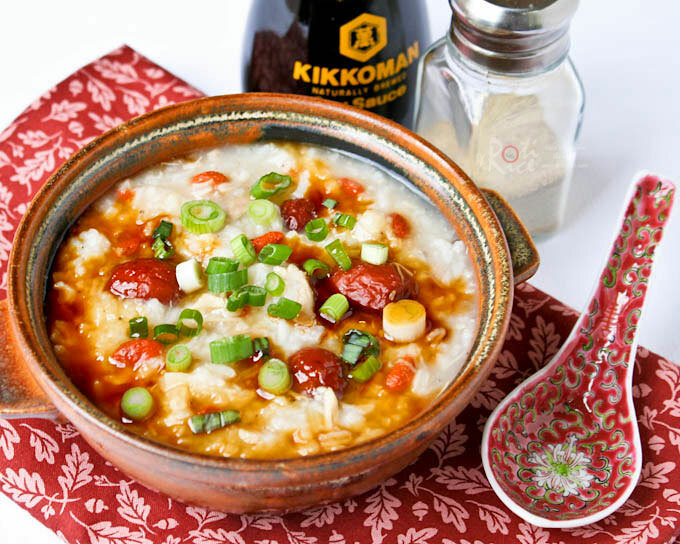 We do love our jook, don’t we? It is so comforting. Not sure about the chicken feet though…LOL! Wow! What a luxurious chok! This idea will come in very handy when I am grappling with the remains of our Christmas turkey 😀 Love the inclusion of peanuts. I have always love peanuts in my chok. So tasty and satisfying. I hope you will give it a try. Great way to use up all that meat. We had a 24 lb bird, my hubby loves his left over. And I love using the left over to make different recipes-I got 5 different dishes beside turkey stock(congee, mee sua soup, American turkey dumpling cream soup, flautas & cranberry turkey ravioli out of the left over meat. One of them is congee as well, made in crock pot cooked overnight on low, at the end I added century egg. Yau Char Kuay is a must in our household. We just toast up the freezer version. Wow…a 24 lbs bird! I have never roasted one that huge. I must say you are very creative with the left overs. I think I may just try it with mee suah as I still have some left over meat. Reminds me of “ark tui mee suah”. “You char koay” in porridge is just the best! My mouth is watering very badly after seeing the pictures… Simply delicious..